Abubakar Malami, attorney-general of the federation (AGF), on Thursday, failed to honour an invitation of the senate, but later issued a statement to say Senate President Bukola Saraki and Ike Ekweremadu, his deputy, will get fair trial. Although, the reason for his absence was not clear, Malami was supposed be appear before senate committee on judiciary on Thursday, a suit of alleged forgery which he filed against the leadership of the 8th senate. Saraki, Ekweremadu, Salisu Maikasuwa, former clerk of the national assembly, and Benedict Efeturi, his deputy, are facing charges of alleged criminal conspiracy and forgery of the senate standing rule‎s, 2015. Declared that its standing rules were authentic and not forge, the upper legislative chamber resolved to mandate its committee on judiciary to summon the AGF “to explain and to justify with evidence the basis for his act and to explain why it does not constitute incompetence, gross misconduct, contempt of court and abuse of office”. The resolution of the senate followed a point of order raised by Dino Melaye, a senator from Kogi west. Melaye had argued that if the senate rule book was forged it implied that‎ the passed 2015 budget, and all ministers confirmed by the upper legislative chamber were fake. But in the statement issued on his behalf by Salihu Isah, his spokesman, Malami insisted that those charged have a case to answer. 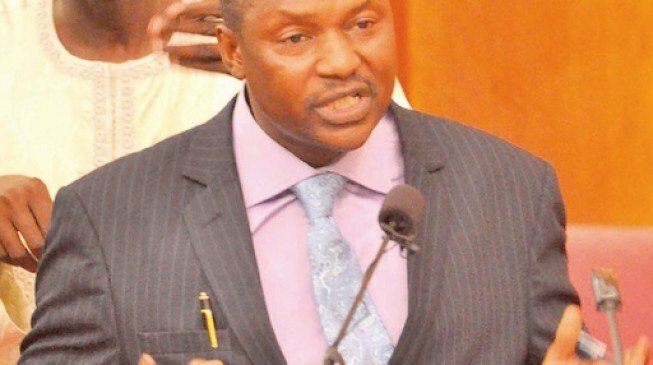 “The attention of the attorney-general of the federation has been drawn to a press statement by the senate, signed by Senator Aliyu Sabi Abdullahi, chairman, senate committee on media and affairs, on June 19,” Malami’s statement read. “The statement entitled: ‘Forgery Case, An Unconstitutional Violation of Principles of Separation of Powers, Checks and Balances’, was published in some national dailies and social media platforms. “It is quite unfortunate that the senate construed move of the federal government as a coup against the legislature with a view to cause a leadership change in the national assembly.